The denim jacket has long been a wardrobe staple for women. The garment, with its casually stylish appeal, is unbeatable for relaxed outfits, making it a classic piece of fashion. 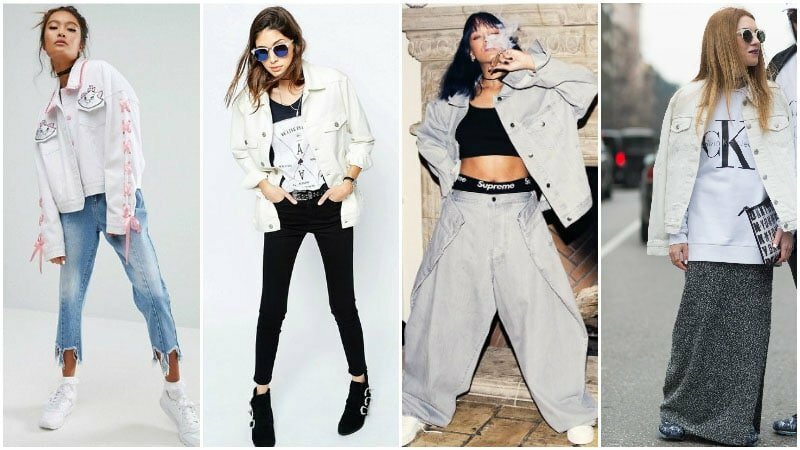 For 2017, the denim jacket looks set for a resurgence in popularity, meaning that it’s time to brush up on the coolest styles and how to wear them. Today, a denim jacket can mean any number of things. It can mean a classic blue design or something a little more modern, such as black or white. It can mean the cropped cuts we’ve loved for years or the new breed of longline styles that have become exceedingly popular. Either way, rocking a denim jacket is no longer as simple as it once was. That’s why we’ve enlisted the help of some super stylish celebs to show you how to wear one the right way. The strong fabric of denim combined with a dark, black hue creates an edgy look for a jacket. Gigi Hadid knows the power of this style and uses it to her advantage. The model plays up the rock and roll attitude of her black, denim jacket by choosing a longline version and wearing it as a dress. Partnered with over-the-knee boots and a choker, Gigi creates a bold and daring night-time look. Although Gigi’s outfit is perfect for evening outings, black denim jackets can also be worn during the day. By translating the model’s look into a more casual style, you can create an outfit that’s edgy and cool but also daytime appropriate. All you need to do is ditch the long boots and add ripped, skinny jeans and a T-shirt. Replacing the boots with sneakers is also an excellent way to rock this trend while paying homage to Gigi’s usual athleisure style. A white denim jacket can be tricky to pull off, but Rihanna proves that all it takes is a little confidence. Although the singer perfectly pairs her white denim jacket with oversized, wide-leg pants, this full-volume look doesn’t suit everyone. For those looking to pull off Rihanna’s double denim style without the bulk, you can opt for skinny or straight jeans. If you like the voluminous style but wish to wear less denim, try a maxi skirt instead. Rihanna chooses to wear white sneakers with her white denim ensemble, and you can rock them too. White sneakers will help balance the lightness of your jacket while keeping your style casual and cool. When it comes to the colour of the rest of your outfit, try to keep it minimal. Black will help ground the look and create balance while brighter colours will appear as an awkward contrast. A classic, blue denim jacket is always a great style to have in your wardrobe. The garment is perfect for practically any casual outfit and can be worn year-round. Actress, Emma Roberts puts a feminine spin on her blue denim jacket, pairing it with a striped, pink dress and leopard print heels. Pairing a denim jacket with a lovely look, such as this, is a winning style that you must try. You can channel Emma’s outfit with a dress of your own or mix it up with a skirt and top. Just remember, the best way to balance a thick denim jacket is by defining your waist and keeping your bottom half slim. Like your jeans, a blue denim jacket pairs well with any colour. For warmer weather, follow Emma’s lead and pair your jacket with bright colours. When it comes to cooler climates, darker hues look seasonally suitable. 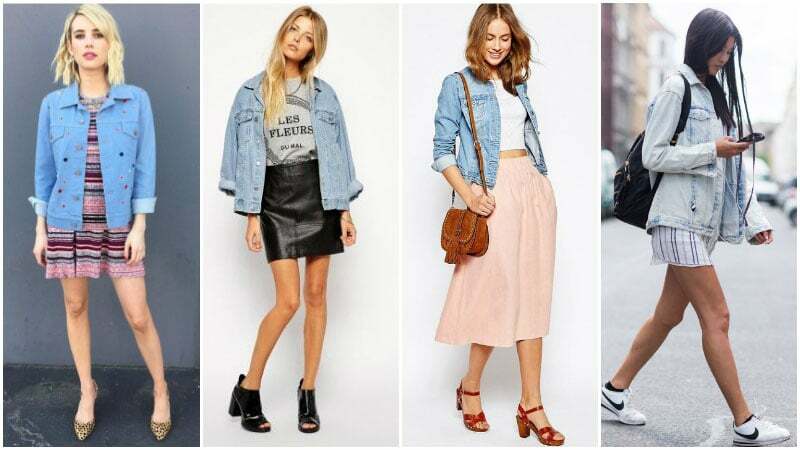 Short and cropped denim jackets are a classic style. Although they may go through popularity highs and lows, the style never dies and always comes back. At the moment, the style is fashionable once again and a favourite go-to piece for both celebrities and the street style elite. Khloe Kardashian is such celebrity that rocks cropped, denim jackets. Showing off her “revenge body”, she pairs her jacket with skinny jeans in a matching hue and a sheer, lace top. No matter what your personal style is, Khloe’s cool cropped denim jacket outfit can be tailored to suit your wardrobe. For ladies who like a feminine aesthetic, you can skip the skinny jeans and wear your denim jacket with a lace dress. If you like an athleisure look, keep the colour palette consistent but swap jeans for shorts and heels for sneakers. If you’re a fashion risk-taker, on the other hand, take Khloe’s double denim a step further with a denim jumpsuit underneath your jacket. While cropped and hip-length denim jackets have a traditional and classic feel; long denim jackets feel edgy and more contemporary. Although the oversized denim jacket has long been a grunge staple, today’s longline versions are decidedly more modern with a lighter weight and less bulky appearance. 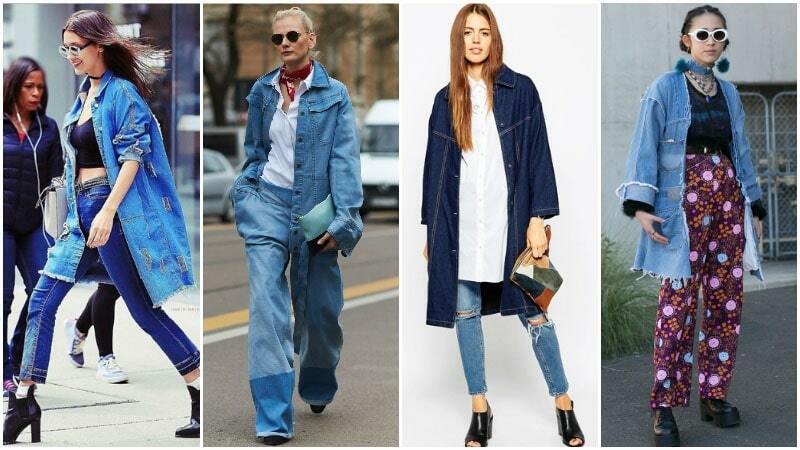 Of course, the bold style of a long denim jacket, no matter how heavy, always demands a bold outfit. Just remember, if you’re petite, you should balance the larger silhouette of a long jacket with a defined waist, fitted or slim pants, and heels. When looking to rock a long, denim jacket, you can take inspiration from the stylish Bella Hadid. The model/social media star pairs her denim jacket with a black crop top, dark blue skinny jeans, heeled booties and some retro sunglasses. Perfect for a fashion-forward weekend outfit, Bella’s look sits in the middle of casual and statement-making. If you wish to play down Bella’s look for a chic and simple style, you can pair your long denim jacket with skinny jeans and a white shirt. For those who want to make their long denim jacket into even more of a statement, you can channel a street style star with wide-leg pants, patterns, and bold accessories.